Retrospective study from Hamburg, Germany looking at steroid use in subarachnoid hemorrhage. Hypothesis on how steroids might possibly improve outcome? Dexamethasone has positive effects in the surgical group (a priori assumption that these patients more likely to have space-occupying hemorrhage and brain edema where surgery is deemed favorable) because the anti-edema effects of dexamethasone may positively influence the post-operative course. Dexamethasone does not work by preventing DCI. Take home message: Not enough data to routinely recommend starting patients with clipped aneurysmal SAH on dexamethasone. On patients treated with endovascular coiling, dexamethasone shown to have deleterious effects and worse outcomes and therefore, should be avoided. Czorlich, P. et al. “Impact Of Dexamethasone In Patients With Aneurysmal Subarachnoid Haemorrhage”. European Journal of Neurology (2017): Feb 17. doi: 10.1111/ene.13265. [Epub ahead of print]. Heparin Drip for DCI prevention in Aneurysmal SAH? Interesting article from Journal of Neurointerventional Surgery looking at use of heparin after endovascular treatment of cerebral aneurysms. The study was retrospective, included ~400 patients (~200 given heparin post-coiling and ~200 matched controls), and collected data on incidence of vasospasm, DCI, and functional outcome. Rate of severe vasospasm was shown to be significantly reduced in the heparin group (14.2 vs 25.4% p=0.005). The study concluded that patients who received continuous heparin after endovascular coiling of cerebral aneurysms have a reduced rate of severe vasospasm. How does heparin prevent DCI? (theoretically) The article explains that heparin prevents secondary injury in SAH through its anti-inflammatory effects. Heparin is the highest negatively charged biological molecule existing. Due to the negative charges, it can bind to positively charged proteins and surfaces, including growth factors, cytokines and chemokines – thereby reducing inflammation. It can also bind oxyhemoglobin and block free radical activity. It can also antagonize endothelin, reducing endothelin-related vasoconstriction. The study has several limitations – including the retrospective and single-center nature of the study design, and the potential for selection bias – even with case matching. This study adds more evidence (albeit weak) to the argument that heparin infusions may help prevent secondary brain injury in patients with aneurysmal SAH who undergo endovascular coiling. Heparin would be a potential “4th H,” adding to the 3 H’s historically used in the vasospasm prevention – i.e. hypervolemia, hemodilution, hypertension. As with the previous H’s, randomized controlled studies will need to be performed to prove this theory. The first 3 Hs have largely been debunked, and instead, the current standard of care is to keep patients with subarachnoid hemorrhage euvolemic, and induce hypertension only in the setting of vasospasm and/or delayed cerebral ischemia. Therefore, as with the first 3 Hs, until more evidence surfaces, the use of continuous heparin cannot be recommended in this setting. Bruder, Markus et al. “Effect Of Heparin On Secondary Brain Injury In Patients With Subarachnoid Hemorrhage: An Additional ‘H’ Therapy In Vasospasm Treatment”. Journal of NeuroInterventional Surgery (2017): neurintsurg-2016-012925. Neurocritical Care Society provided dosing cards for IV and PO AEDs in their website for free. See links below for PDF files. Tesoro, Eljim P. and Gretchen M. Brophy. 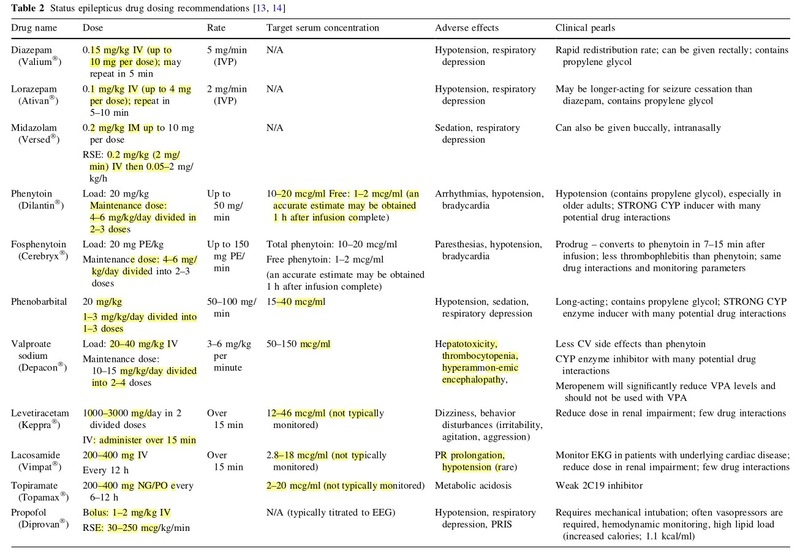 “Pharmacological Management Of Seizures And Status Epilepticus In Critically Ill Patients”. Journal of Pharmacy Practice 23.5 (2010): 441-454. Web. Type II – delayed but patent graft enhancement and anterograde flow during capillary or venous phase. Type III – delayed anterograde flow, no continuity to bypass site or with no convincing flow at all.